The music world is still reeling from the death of Leonard Cohen, but an upcoming show in Montreal is hoping to help fans and musicians turn their mourning into celebration. 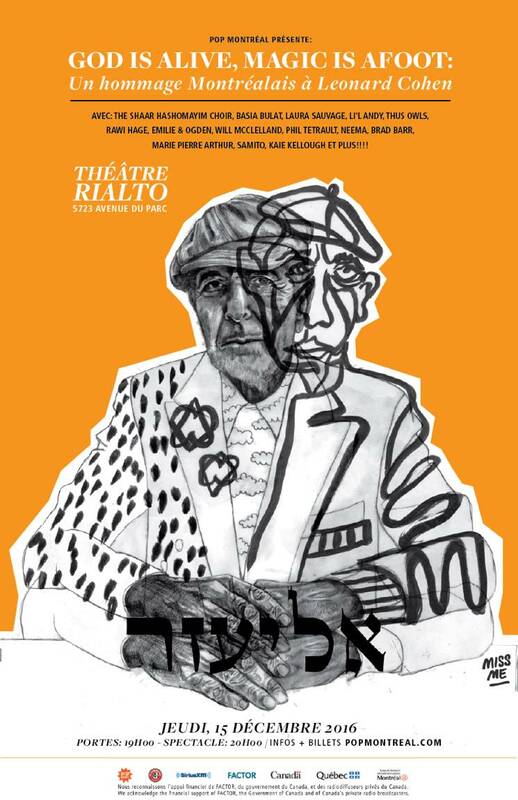 Organized by the folks at POP Montreal, a special concert going by the name "God Is Alive, Magic Is Afoot: A Tribute to Leonard Cohen" is set to take place on December 15 at the Rialto Theatre. It's been given the Cohen family's blessing, and the roster for the evening event will include performances from the Congregation Shaar Hashomayim Choir, who sang with Cohen on his final album You Want It Darker, as well as Basia Bulat, Thus Owls, Laura Sauvage, NEeMA, Emilie & Ogden, Daniel Isaiah and Li'l Andy. All of those artists will be backed by a band featuring members of Esmerine, Thus Owls and Shtreiml. In addition to tributes in song form, Montreal's literary community will also be contributing to the show. Rawi Hage, Phil Tétrault, Kathryn Jezer-Morton and Will McClelland will read selections from Cohen's poetry and novels between the musical sets. Cohen stands alone as a songwriter — apart from Dylan, apart from Tom Waits, apart from Joni Mitchell — he really is in a category and class of his own. As a poet, a novelist and a singer, he looked at the horrors of the 20th century right in the face and examined his own experience to create a message of hope. And this show will be an expression of that legacy, a celebration of that hope amidst brokenness that he spoke of so eloquently. This is a show we've been preparing for in our hearts since we first heard or read Cohen and felt a kinship to him. That's the thing about Cohen fans: we all feel like he's ours. But here in Montreal, he's ours more than anywhere else in the world. More performers are expected to be announced in the coming weeks. Tickets are currently available for $25 and can be purchased here. Proceeds from the show will be donated to Le Chainon.